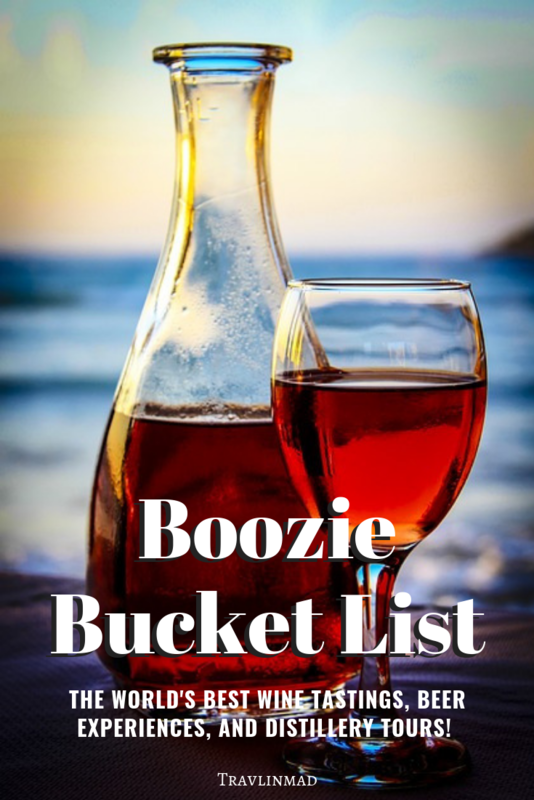 With foodie tourism as hot as ever, isn’t it time for us to make a Boozie Bucket List just for all the special drinking experiences we’ll need to wash it all down? From craft distillery tours and wine tasting tours to booze cruises and beer spas, these 30 bucket list drinking experiences around the world are perfect for that list and some of the best, ahem… educational experiences for foodies and boozies. Whether you’re a fan of imbibing or not, there’s no denying that beer, wine, and spirits are a huge part of the foodie’s world. Brewing, distilling, and fermenting are as much a craft as preparing the foods to pair with it, and it’s hard not to be in awe of the chemistry and finesse it takes to achieve some of the world’s finest. But who are we kidding? It doesn’t have to be the world’s best for us to enjoy it! Some of the coolest travel experiences we’ve ever had involved tasting the locally-made brew or spirits, like the rakia made from fermenting grapes that we slammed down and shot back in Slovenia. Or the sturm wine — the potent first pressing of wine at harvest time — that we drank along the South Styrian wine road in southern Austria. It may not be the world’s finest quality, but it’s slow travel at its best. Every family or estate makes their own and just one sip connects you with centuries of local history and culture — and of course, sharing it with the locals is even better. We dare you to find a better experience than sipping some homemade wine with the Italian farmer who made it, or the gratis shot of Italian limoncello you’re offered at the end of a good meal in Capri or Positano. It’s their way of saying Grazie… thank you for sharing your meal with us. We wanted to share some of our favorite boozie tours and experiences with you — more than just our favorites bars and hangouts. So we scoured the world for some of the best (it’s a tough job) and asked expert travel writers to share their favorites too. Here are some of the most unique craft beer tours, wine tours, distillery tours, and booze experiences for your Boozie Bucket List! Prague is known for large pints of light pilsner beer. Plzen, the namesake of Pilsner, is a city not far away, so this makes sense. And yet the modern Czech beer landscape is deeper and more varied than that. Urban Adventures runs a Prague Beer Tour which takes the small group through four different bars in a few different neighborhoods to savor beers and the food that goes with that beer. Starting in the late afternoon, it runs for about 4 hours into the evening with plenty of beer and plenty of food. It was enough food to not need dinner afterwards. The places range from a brewery in a modern cellar, through a traditional pub where we ate delicious oil marinated cheese paired with a dark beer, to another pub where food of all types matched with the beer of your choice. And yes, of course there is a stop to taste the famous Pilsner, but by that point you know that however famous that beer is, the landscape is far wider. I had a great time on this tour, and it was a great way to learn about craft beer in Prague along with some traditional Czech food. Length of tour: 4.5 hours. Book through Get Your Guide. Interested in Prague food to go with the beer? Check out the traditional Czech foods we ate along the Taste of Prague food tour. Grey County is a region just a few hours from Toronto, Canada, and is known for its great outdoor adventure activities. But perhaps one of the best trails is one that is not meant to be hiked. The Saints and Sinners Trail features local craft beer, cider and wine and allows you to enjoy the beauty of the region in a much different way. One of the highlights along the Trail is The Corkscrew City Prohibition tour, located in Owen Sound, which was the last city in Canada to end prohibition. City councillor and local historian Richard Thomas runs the tour on The Beer Bus and stops at historical spots such as Roxy Theatre, museums and local breweries. The tour ends at Mudtown Station Brewery, which was once a Canadian National Rail station and has been renovated into a brewery. Along with retro posters and artifacts the adjacent dining room maintains its original walls as the waiting room for the train. It’s a piece of Canadiana like no other. The menu has lots of great options featuring local food with gluten-free and vegetarian options. But the local favorite is the burger. It never disappoints. Length of tour: 4.5 hours. Tours run from 3-7:30 pm and must be booked in advance through the Beer Bus. Cost: The cost is $100. Colorado is at the epicenter of the craft beer renaissance in the USA and Denver is its capital. Only Chicago has more breweries than Denver but across a much larger geographic area. The concentration of craft beer outlets in Denver is unparalleled. How do you pick from among the 160+ choices and then how do you find them and visit them? We say, “take a Denver beer tour”! The Denver Beer Cruise is a craft beer tour of some of Denver’s most innovative breweries. Owner, Cruise Captain Brent Scheiwe likes to get people off the beaten path and into lesser-known breweries. Their tours start in downtown Denver at Pint’s Pub, an English-style pub complete with a red phone box. Scheiwe rotates his tours between 6 breweries across Denver — Seedstock Brewery, Strange Craft Beer Company, Burns Family Artisan Ales, Banded Oaks Brewing, DeSteeg, and Factotum Brewhouse. In an effort to get tour participants out of their style comfort-zone, he lets the brewers pick the styles and beers to be tasted at each brewery, and endeavors to keep the travel time between beers to around 15 minutes so no one gets too thirsty. The tour includes a brewery tour led by the brewer at the first stop, and a bit of style education at the second stop and plenty of social time at the third stop after everyone has been properly lubricated. Length of tour: Approximately 4 hours and includes transportation to three breweries and a generous amount of beer at each stop. The Denver Microbrew Tour offers excursions that sprinkle in a bit of history and art with beer tours in two of Denver’s most venerated craft beer neighborhoods. LoDo (Lower Downtown) is where Colorado’s craft beer revolution began with the Wynkoop Brewery in 1988, the first brewpub in the state and RiNo (River North) which is now known to as the Napa Valley of craft beer for the density of brewpubs and breweries in this once industrial neighborhood. Steve Schneiter leads a walking tour to 3 brewpubs and a cidery in RiNo — Ratio Beer Works, Our Mutual Friend Brewing, Bierstadt Lagerhaus, and Stem Ciders — and another tour to 3 brewpubs and one tap house — Wynkoop Brewing, Jagged Mountain Brewery, Rock Bottom Brewery, and Falling Rock Tap House — in LoDo. The tour lasts 2.5 to 3 hours and the guide picks the styles and beers to sample. The RiNo Tour includes visits to Crush Walls street art locations with stops at Instagrammable spots. The LoDo Tour includes stories about Denver’s Old West History during the walk between breweries. Cost: $40 USD/person and includes a commemorative glass and 10+ beers samples. One of the best things to do in Namur, Belgium is to go for a beer tasting inside the walls of the old Citadel. This was probably one of the most unique beer tastings I have ever experienced in 10 years of traveling. The beer tasting includes 5 beers and takes place in the old gunpowder room of the Citadel, where is very dark — pitch black. The only source of light comes from the flames of a few candles set on a barrel which serves as the table. In the middle of the room, beer crates are stacked to create a throne — “The Game of Beer” — as the guide told me. Out of the five beers you’ll taste here, one of them is locally produced. Blanche du Namur is a white beer, light and smooth. When you taste it, the guide also shares the story of how the beer got its name and the story of Blanche du Namur. Hint: she was a princess. Length of tour: About 1 hour. Experience is for a group and must be booked in advance at info@citadelle.namur.be, as it is not available on a daily basis. Going to a beer spa might just be the ultimate activity for beer enthusiasts. Not only is it relaxing, but you will also enjoy free-flowing beer. When you’re looking for a beer spa, Prague is one place where you’ll have your choice, but I visited the Beer Spa Beerland Carlsbad (Pivne Lazni in the local language), one of the beer spas in the spa town of Karlovy Vary in the Czech Republic, and it was a very memorable experience. For 30 minutes, I sat in the hot tub with my very own beer tap next to me. I could choose between a darker beer, light, and regular from the local beer brand Krusovice. Before the session, a lady from the spa poured malt and hops into the steaming hot tub. And then of course, you are free to pour how much beer you want inside the tub as well. It’s quite fun to bathe in beer and at the same time drink as much as you like. It’s an ideal activity for friends or couples. This beer spa in Karlovy Vary offers a private session for two in one or two hot tubs, or 4 people in two hot tubs. The Czech Republic is known for their unique beer spas — a unique and fun way to enhance the already amazing Czech beer. Here’s one to try at Svachovka near Cesky Krumlov! While the foodscene in the Cook Islands may not be famous, there are some gems to be found. This includes exciting dishes, restaurants, cafes, and even a few breweries on the island of Rarotonga. One of the most unique brewery tours I’ve ever done is the Matutu Brewing Company. South Pacific nations are typically not associated with good quality beer, but Matutu begs to differ. The Matutu Brewing Company structure is small. It is technically a two-room small warehouse. The brewery "tour" is basically sitting on two kegs with a slab of wood between them for a seat. While you're seated, you listen to the friendly and funny guide and sip samples of their beer. The Matutu Brewery Tour is offered at noon and 1pm daily, and it costs NZ$15. Throughout the one hour tour, visitors get a quick history and tour of the humble brewery, as well as a few samples of Matutu’s best products: the refreshing Mai Lager and the Kiva Pale Ale. If you like rich flavored beer, don’t miss the locally sourced coconut and vanilla flavor stout. It is one of Matutu’s signature products. At one point in time Milwaukee, Wisconsin brewed more beer than any other city in the world giving the city the nickname “Brew City”. Today many of the big breweries have closed up shop leaving room for smaller (and better) local craft breweries — and one of the best ways to do a brewery tour in Milwaukee is by cruising down the river. A boat tour with Riverwalk Boats will bring you to three craft breweries that line the banks of the river over the course of 4 - 4.5 hours. The stops change from time to time so you can sample all of the great beer in “Brew City”. You also have some time at each stop to try some local dishes along with your brews. Another great option among the Milwaukee brewery tours offered is a river pedal tour where your two feet help drive a large paddle wheel bringing you between the breweries. It’s a lot of fun and a great way to burn some extra calories so you can indulge in all the great food found at the restaurants and gastro pubs along the river in Milwaukee! Cost: $40 USD and includes beers at each stop. The South Bohemia city of Ceske Budejovice should be on every beer lover’s bucket list since it’s the original home of Budweiser beer! That’s right — and sorry, my fellow Americans — this American heritage brand originally belonged to the Czech Republic as Budvar beer, since it’s been made in South Bohemia since 1265. 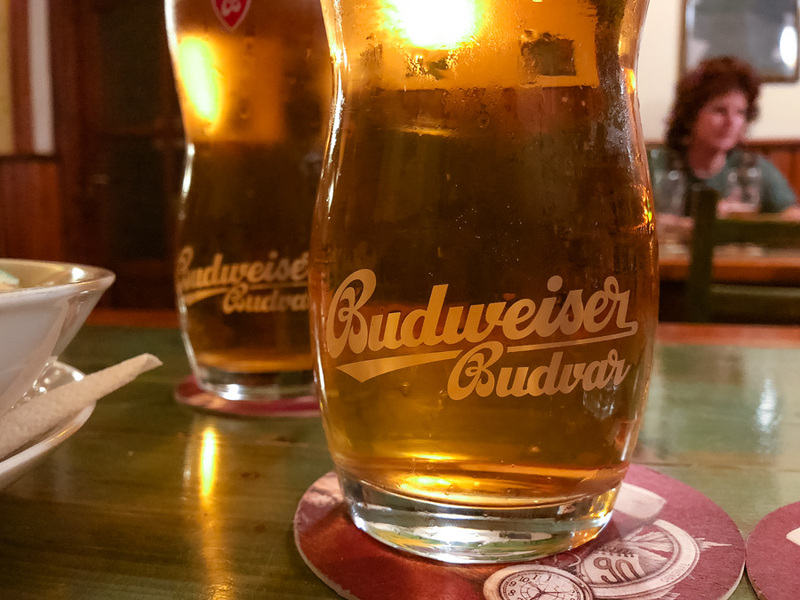 The name Budejovice means budweis, or beer, and the Budvar brewery tour is a must. Made from Moravian barley, Saaz hops, first-rate brewing yeast, and the brewery’s own water from 300-meter deep artesian wells, the recipe for Budvar has certainly stood the test of time. What’s the difference between Budvar and Budweiser, you might ask? The Anheuser-Busch beer is far more carbonated, and much lighter in color and taste. Your favorite micro-brew is likely more similar to Budvar, so if you’re a fan of European-style beers like we are, you’ll love Budvar. Length of tour: 1 hour. The Budvar brewery tour cannot be attended without a guide. Daily tours are in Czech, English and German at 2pm (also in Russian, French, Spanish and Italian upon advance request). Welcome to one of the most fun and alcoholic things you can do in Dublin: The Guinness Storehouse Tour! Lasting at least 1.5 hours (but I recommend staying for much longer) you will have the chance to self-guide yourself around this mesmerising interactive storehouse through a number of really cool experiences. Even if you’re not into beer, still come. The storehouse itself is fascinating to even be within. It’s Disneyland for adults who love a pint of the dark stuff. On the ground floor, you’ll discover exactly what’s in a glorious pint of Guinness (it’s all delicious) and once you hit the second floor, they’ll teach you exactly how to drink it (there is a right way!). If you want to take your Guinness pouring skills to the next level, you can do that on floor 4. There’s a very good chance you’ll catch live music in here too! The absolute highlight though is once you reach the very top of the storehouse, where you’ll get panoramic views of Dublin, standing round the very swish Guinness Gravity bar. Do not skip this experience during your visit in Ireland: it’s well worth the €18.50! Reserve this 2-hour intimate guided tour of the Guinness Storehouse Guinness Beer Club through Get Your Guide. From one brewery to the next, there seems to be no difference in the way that beer is made. That was the perception I had until I visited Brasserie Cantillon in Brussels. The Anderlecht-based brewery has been family-run from the beginning and is the last surviving maker of lambic beer in the Belgian capital. Cantillon beer has become very popular of late, thanks to the growing appreciation of craft beer around the world, so it would be remiss not to see how the beer that geeks rave about is produced. You can visit the brewery during its opening hours on your own without making an appointment, just as I did. After paying 7 euros for the self-guided visit, I received an information sheet and followed the signs around the facility, learning about how the wort is fermented spontaneously (rather than under controlled conditions), then hopped, barrel-aged and blended to produce gueuze. It was a process that I had never seen elsewhere. At the end of the tour, I got to taste a couple of the famous tart, funky and well-rounded lambic beers. Cost: €7 ($8 USD) self-guided tour Mon-Sat (except Wed) between 10am-4pm. €9.50 ($11 USD) Guided tours Fri & Sat (book in advance online only). We love Get Your Guide for reliably good tours: This 2.5-Hour Belgian Beer Tasting Experience includes a 3-beer tasting flight and a bottle of Trappist ale! Every once in a while when you’re wandering the vineyards among the rolling hills of Tuscany, there’s an unexpected pleasant surprise. Taking its name from the 10th-century convent that stands to this day, Pacina Winery is that kind of surprise. A small settlement with a few stone and stucco buildings, the magic of everything that goes into making fine Tuscan wine comes solely from the surrounding fields and vineyards. Pacina is a place where Mother Nature still rules — the husband and wife owners and vintners use what She provides and leave fertilizers, pesticides, and irrigation behind. Instead, they plant grasses between grape rows and rotate crops to replenish the soil. Fields that surround the long rows of vines, some very old, are planted with vegetables, cereal crops, greens, fruits, and the unmistakable silver-green leaves of olive trees. All this to maintain the rich ecosystem that nourishes the vines. Pacina’s wine is organic Chianti wine, despite the fact they cannot display the small Black Rooster seal which designates the wine is from Chianti, because they sit just a stone’s throw from the geopolitical boundary which leaves Pacina just outside of it. Instead, their wines are Chianti Colli Senesi, sometimes referred to as “the other Chianti”. It’s a perfect Tuscany winery to visit for a completely organic and sustainable wine experience, and one of the finest Tuscan wines we’ve ever tasted. Length of tour: 1-2 hours. Looking for more unique Tuscany wines? Try tasting Vernaccia wine at Cappella Sant'Andrea Winery in San Gimignano, and taste the Tuscany Crete Senesi in their organic wines! The tour of the Concha y Toro winery in the Maipo Valley just outside Santiago, Chile is more than just a wine tasting experience. Along the way, we drove through Santiago, past vineyards, and learned about Chile’s wine growing industry. The Maipo Valley is a red-wine growing area. The most interesting wine is the carménère. For about 100 years, this wine was thought to be extinct, wiped out by a plague in France. Meanwhile, in Chile, there was a special kind of merlot called a “Chile merlot” – similar to merlot but not quite the same as all the others. Lo and behold, it was discovered several years ago through DNA testing that the Chile merlot was in fact the long lost carménère. Interesting, and delicious. Concha y Toro is one of the only wineries near Santiago, Chile, and among the largest wine companies in Chile. The tour is well organized and begins outside, where the first tasting (a sauvignon blanc from another wine growing region in Chile) was set up on barrels under trees, with views of a lake, the original owners’ house and a garden made up of all of the different kinds of vines grown in Chile. The tour then heads inside for another tasting before going down into one of the few original cellars to have survived Chile’s earthquakes. One of Concha y Toro’s most famous wines is Casillero del Diablo (Cellar of the Devil) and through a sound and light show in the cellar, you learn how the wine got its name (and see the devil!). The varied nature and theatrical elements make this a unique experience among the many vineyard or wine tours Chile has to offer. Length of tour: 4 hours. Book the Wine Experience through Get Your Guide which includes hotel pickup up/ drop off, a guide on the bus ride to the winery and the actual winery tour. Thirsty for more Chilean wine? Check out this full-day Maipo Valley Vineyards tour with 3 vineyards, or our own self-guided wine tour of the Casablanca Valley, one of Chile’s famous wine regions. The Franschhoek Wine Tram hop-on hop-off tour is one of the most unique ways to discover South Africa’s Franschhoek Valley – the picturesque vineyards, breath-taking scenery, warm hospitality, world-class cuisine, fine wines and a 300 year history. The hop-on hop-off tram is a leisurely way to see the lush Franschhoek Valley as you journey through rolling vineyards in a vintage-style railway tram and open-air tram-bus stopping in at some of South Africa’s oldest and most distinguished wine estates. The wine loop lets you get on and off at your own pace, taking your time to explore and appreciate the experience. The Franschoek Curated Wine Farms Experience takes this wine experience to the next level with a visit to a local wine estate where a knowledgeable wine guide delves a bit deeper into the science of winemaking and shares stories about Franschhoek’s history of wine and culture. Guests will be guided through an interactive experience, and have the chance to sample the subtle tastes of terroir, and learn about the local grape varieties unique to South Africa. Length of tour: The Hop-on, Hop off tram is basically self-guided and can take 4-5 hours or longer. The Curated Wine Experience is approximately 3-3.5 hours. Cost: Hop-on, Hop off tram: Adult R240 ($18 USD) / Child (3-17) R90 ($7 USD). Wine tasting fees at each estate (between $1-$5 USD per person) are not included in the tour price. The Curated Wine Experience: R1050 (around $73 USD) per adult (please note that this is an adults only experience) and includes wine lecture, three course lunch, cellar tour (when available), two premium wine tastings and local transport. Advance booking is essential. In the little known country of Moldova, in Eastern Europe, they hold a World Guinness Book Record for the most wine caves at Milestii Mici. With over 207 kilometers of caves — 55 kilometers filled with wine — they do have something of which to be proud. Visiting the caves is mind-boggling. You ride a train through the caves, visiting the underground wine cellar and huge entertainment rooms where you can taste wine, eat a dinner fit for a king, and even discover some secret rooms used for more than just wine during the Cold War. We sampled five wines and one champagne and were surprised that we'd never heard of Moldova wine before. It's pretty good! Milestii Mici is located not far from Chisinau, the capital city of Moldova, and if you are there, it's the one thing you cannot miss. Cost: Starts at the equivalent of $12 USD, but there are many options depending on how much wine you want to taste and how much food you care to eat. We took the two hour tour, with five wine tastings and snacks for about $38. You can’t think about Porto and not think about wine, and a fabulous way to experience a port and wine tasting close to Porto is to take a Douro Valley wine tour. I joined a tour with CoolTour Oporto, and our guide drove us to the beautiful Douro Valley, just an hour and a half outside the city. Here we visited a winery to taste three kinds of Portuguese wine while enjoying killer views across the valley. We also tried some local honey and olive oil which is also produced here, and our guide explained the process of making cold-press olive oil. We had the chance to buy a bottle of wine here, perfect to take on our river cruise after lunch. Lunch was huge portions of cod croquettes, roast chicken and salads, accompanied by vinho verde – green wine from the Douro Valley region. As our meal was digesting, we took a Douro Valley river cruise (opening the bottle of wine we’d bought at the winery), and then visited another winery which produces several different kinds of Port wine. We had a fabulous day drinking and eating and admiring the beautiful views of the valley. Perfect! Book your Douro Valley Wine Tour & River Cruise on Get Your Guide: Spend a full day taking in the landscapes of the Douro Valley, tasting port wines, table wines and olive oil, and enjoying a traditional Portuguese vineyard lunch, then cruise the afternoon along the Douro River. The Kakheti region of Georgia is a haven for any wine lover — it’s not only the largest wine growing region in the country but in all of Eastern Europe too! One of the most popular places for wine tasting in Kakheti is the small hilltop town of Sighnaghi where there are three big wineries in the town that run organized tours on a daily basis. The wine tour I attended was at the extremely picturesque Pheasant’s Tears Winery in Sighnaghi. The winery is built on top of a hill with a restaurant serving Georgian food that has incredible views over the Caucasus Mountains of Azerbaijan and Russia in the distance. The most popular wine of the region is called “Chacha”, which is a sour wine, but the local people love to have it during the dinner. The winery has more than a hundred different kinds of fruit plantations that are used to make the wine. Apart from a wine tasting, the tour also includes a cooking class experience where local women will teach you to bake the traditional Georgian bread and a delicious walnut dessert. The bread and the dessert are then served for the lunch along with other authentic Georgian cuisines. Length of tour: 1-2 hours, and includes a walk through the grapes garden, traditional Georgian wine making demonstration and wine tasting, plus a Georgian bread and walnut dessert cooking class. Heading to Budapest, Hungary anytime soon? You must sign-up for a wine tasting with Taste Hungary without delay. It is one of the most stylish and popular wine galleries in Hungary offering a tasting experience in a cozy setting around a high wine tasting table. Their Essentials of Hungarian Wine tasting is a crash course in Hungarian wines: you’ll learn about different regions where the wines are made and the process of fermentation. An experienced wine sommelier conducts the wine tasting session and guides you through the various red, white and sparkling wines from Hungary. You'll also taste a fine range of regional foods to accompany the wine such as dried fruits, a variety of cheeses, and homemade breads with dipping oils. It’s a fun evening learning about the wine culture and all the nuances of Hungarian wine production. So take a seat, and get ready to taste some of the finest Hungarian wines accompanied with their best cheeses and charcuterie. One of the best tours I have ever been on was a Champagne tour from Paris to Reims, France. I knew virtually nothing about Champagne except that I enjoyed drinking it before the tour. There are so many options for champagne tasting trips from Paris and Reims deep into Champagne country and I was able to explore it thoroughly. Of the champagne tours in Reims, my favorite was actually right in the heart of Reims. Champagne house Lanson is the only one that actually has a vineyard in the city of Reims itself and you can take an affordable tour of their facility and cellars while never having to venture outside of the city (I walked there). The tour will send you around with a small group of people, an expert guide, and you can select how many glasses of Champagne you want to taste at the end. Altogether, the tour lasted 1 hour and 30 minutes. I opted for the 3 glasses of Champagne and got to taste a variety of what they had to offer, including their Prestige. For the 3 glasses plus the tour, it was only 40 Euros and a great introduction to France's renowned Champagne region. Like every country, South Korea has its own alcohol, and there are lots of different types, but the two most well known are soju and makgeolli, one of the oldest alcoholic drinks in Korea which dates to the Goguryo Dynasty. Both are made by fermenting a rice mixture. They are widely available in supermarkets and any convenience store. But to taste the real good stuff, going on an alcohol tasting tour is highly recommended. On the 3-hour long Brew Master Tour with Gastro Tour Seoul, you'll have the opportunity to visit the brewery of the best soju and makgeolli brewer in South Korea. In the brewery you’ll sample different types of soju and makgeolli and learn about how these alcohols are made. After your visit, the tour continues to a local restaurant which serves its own homemade makgeolli — a real treat! Snacks and side dishes are provided during all the tasting sessions (so you don't arrive back at your hotel too drunk). This tasty drink is opaque and milky, with a sweet sparkling flavor, and an ABV (alcohol by volume) of around 6-8 percent. If you try it and love it, you can even make makgeolli at home! We fell in love with the wines of the Tualatin Valley in Oregon, the northernmost part of the Willamette Valley — the state’s famous wine region — and were surprised to find more than grapes making their elegant wines. Saké One is one of the largest brewers of premium Japanese-style saké (rice wine) in the Pacific Northwest. They brew their sake in a variety of styles: from the bold and crisp G Saké and fruit-infused Moonstone to the more versatile Momokawa brands. A tour and tasting of Saké One is unique if you’ve never seen large-scale production of rice wine, and lest you think it’s just the stuff served hot at your favorite sushi bar (and you have to hang on when you drink it), think again. Premium saké is like a fine wine. The best are generally served chilled or at room temperature, and they’re especially good when used to cook with. If it has to be served hot to enjoy it, it’s a sure sign of a lesser quality rice wine. So if you’ve only had hot saké before, here’s your chance to broaden your spirits palate. Located just outside the hip, fun city of Portland, widely known for their incredible craft beers, this region makes a fun day trip. But there’s so much to see and do in the Tualatin Valley that it really deserves a few days to explore all the great wineries — and restaurants too. Length of tour: About 1 hour. Brewery tours are offered by appointment only Wed & Thurs (with at least 48 hours notice) and at 1, 2 and 3pm Fri-Sun. Tasting room is open Wed-Sun. Gen Yamamoto is an understated cocktail den tucked in the glittery nightclub district of Roppongi of Tokyo, with no art or even liquor bottles decorating the space. Instead, there is just a single barkeep, Yamamoto himself, exclusively offering a nightly four- or six-course cocktail tasting menu to patrons, who are seated together in 90-minute time slots. There is no menu and no explanation of what the cocktails are going to be before you order; instead, the cocktails are painstakingly crafted to reflect shiki, or Japanese seasonality, and thus, are constantly rotating to reflect whatever herbs, fruits, or vegetables are locally in-season. Drinks are generally based on a Japanese spirit, like sparkling sake, shochu (a sweet-potato based spirit similar to vodka), or whiskey and are complemented by surprising ingredients like wasabi, green tea, or tomatoes. The components of each cocktail and its origins are carefully explained to guests as Yamamoto hand-squeezes a Japanese peach or delicately chops a radish for garnish to be added to the concoction. The drinks are created to reflect chōwa, or harmony — the sourness of a Japanese apple with a touch of sweetness of shochu; the brightness of hanayu (a Japanese citrus) with the earthiness of gin. Instead of feeling imbalanced after your four cocktails, you will leave Bar Gen Yamamoto somehow feeling more connected and ready for what awaits you in the Tokyo night. Germany is known more for its hearty bier steins and lively Oktoberfest than any distilled spirits, but the tradition of distilling the grains that grow well in northeast Germany is making a big comeback with tourists. Korn is to Germany what vodka is to Russia, and tequila is to Mexico, but despite its name is not made from corn as we know it in the US. Rather, Nordhäuser korn — and doppelkorn, the double-distilled version — is usually made from wheat, barley, rye, or malt. In the city of Nordhausen, which sits along the Zorge river at the southern edge of the Harz mountains in the fertile region known as the Goldene Aue, or golden floodplain, the traditional German distillery Echter Nordhäuser makes their famous Nordhäuser doppelkorn and korn schnaps from rye and malt only, giving the spirit such a unique — and uniquely German — taste sensation. The Harz mountain region is one of the prettiest places we’ve visited around the world, with some fascinating and poignant WWII history. And of course, we loved the food, beer, and now their doppelkorn spirits! London has a long-standing love affair with gin. In the 18th century, London went through a period affectionately known as the Gin Craze, during which there was pretty much a gin distillery or shop on every street in the city. Though the craze died off, London’s gin heritage lives on — so where better to go on a gin experience and distillery tour? You have several options when it comes to choosing a gin distillery tour in London but my favorite is the tour at the small-batch City of London Distillery. The distillery might have only opened in 2012, but it has made its mark on London — producing award-winning gins that are the delight of many a gin-lover and running a cool gin bar that’s one of the best bars in Farringdon. The distillery tour walks you through the gin-making process, where you get a chance to peek at the stills and find out all about the botanicals used in the different types of gin. Of course, the gin tasting experience afterwards was, unsurprisingly, one of my favorite parts of the tour! For a uniquely British combo, tour London’s famous Beefeater Distillery and Borough Market, the oldest and largest food market in London dating back to 1014. This 4-hour guided tour includes both distillery, market, and gin tastings also includes a prepaid Oyster card for the London Underground! Moonshine is made in just about every culture in the world, whether it’s korn in Germany or rakia in Slovenia. Every culture distills whatever’s locally grown — from grain, corn, rice, grapes — pretty much anything with a high enough sugar content can yield a local hooch or moonshine. In the eastern United States, where corn grows in abundance, making moonshine has been a regional pastime for generations since the Scots-Irish settlers brought their recipes for making whiskey without aging it to the US in the 18th century. These same recipes of questionable proof and quality are still made illicitly today in areas like Appalachia. But in Virginia, one man took steps nearly 30 years ago to begin making legal moonshine, with the help of a recipe his Granddad used when he ran illegal ‘shine to the nation’s capital in Washington DC. In 1988, Belmont Farm became the first legal moonshine distillery in the United States, and today owner and Master Distiller Chuck Miller still makes Virginia Lightning on his farm outside Culpeper in north-central Virginia. Touring Belmont Farm Distillery and meeting Chuck in person is some of the best fun a spirits lover can have. Off the coastline of the Mid-Atlantic US state of North Carolina lie the barrier islands known as the Outer Banks, a favorite hiding place for unsavory characters back in the days of shipwrecks, salvage, and thieving bands of pirates. So it’s no surprise that local entrepreneurs have brought back rum in a big way, and are making it in Kill Devil Hills of all places — where Native Americans called rum the Kill Devil, and the hills are sand dunes where sailors often stashed their booty when their ships ran aground. Today, a visit to Outer Banks Distilling is one of the most fun things you can do in the Outer Banks. Tours and tastings of Outer Banks rum are offered daily. It’s hard to imagine Key West, Florida without a rum distillery — it’s as classically Key West as key lime pie. But not until 2012 did the Key West Legal Rum Distillery appear on the scene, ironically in the same location as Jack’s Saloon around 1900, followed by the Coca-Cola bottling plant. How fitting that just 90 miles from Cuba, the Conch Republic was already setting the stage for the perfect Cuba Libre. Today, visiting this Key West distillery is a natural fit and just one of the many fun things to do in Key West. Take the short tour, do a tasting and see which flavors appeal to you. Ask about their Hurricane rum, the flavor of which changed dramatically from the dip in barometric pressure prior to Hurricane Irma in 2017. The operation here is small but their rums are surprisingly smooth and full-flavored. Definitely worth a visit when you’re in town. If you are looking for fun things to do in Edinburgh, then head up the Royal Mile to the Scotch Whisky Experience for a dram of whisky! Scotland is widely-known for producing scotch, a type of whisky specific to the region. The thing about scotch is that there are over 100 distilleries producing different kinds, so it can be hard to decipher the similarities and differences between them. At The Scotch Whisky Experience you can learn all about how scotch is made, the regions of Scotland, ride in a whisky barrel, and even sample some whisky - all under one roof in 1.5 hours! Depending on the tour you book, you can enjoy some cheese and chocolate pairings or even a full evening guided tasting experience with dinner. Overall, the tour guides walk you through exactly how to taste your whisky and what aromas to look for - and their knowledge and expertise certainly adds to the experience of tasting scotch. Cost: The cost of the Gold Ticket is £28.00 (around $36 USD) – but well worth the extra $20 compared to the standard Silver Tour. Book the Ultimate Whiskey Experience in Edinburgh (a Certified Tour through Get Your Guide) with a distillery visit to Dewar’s and Deanston plus stunning scenery across Loch Lubnaig and Loch Leven and a relaxing stop in the village of Aberfeldy. You can travel to Tuscany for wine, Scotland for Scotch, the USA for bourbon, but if you love tequila, you absolutely must go to Mexico. Even better, take a tour to see how this magical spirit is made from the harvesting of agave through the steps that produce Mexico’s world famous drink. The region near Guadalajara in the state of Jalisco — Mexico’s Tequila Trail, where the tequila-producing towns are located — was designated a UNESCO World Heritage site in 2006. Take the Tequila Herradura Express from Guadalajara to the Tequila Herradura distillery at the San José del Refugio Hacienda in Amatitán, and back again. While winding through the scenic Mexican agave fields, you’re entertained by a Mariachi band, served tequila or tequila drinks if you prefer. On arrival there’s a guided tour of the distillery along with an excellent tasting. After the tasting, a full (and filling) authentic and delicious local lunch is served. Length of tour: Full day tour (9-10 hours) starting at 10:00 am and ending at 7:30 pm. Cost: Prices start at $103 USD for adults in the Premium Car, $134 USD for the Club Car (must be 18+), and $124 for the First Class Car (must be 18+). There are discounted prices for those 65 and older as well as for those under 18 riding the Premium Car. Want the tour but not the train? Book this 6-Hour Tequila Tour and Tasting from Guadalajara through Get Your Guide! One of the greatest distilled spirits experiences in the world is the famous Jack Daniels distillery in Lynchburg, Tennessee. And the best way to see it is on the Jack Daniels Whiskey Tour (called the Jack N’ Back tour) offered by Tennessee Whisky Tours. This full-day immersion into Tennessee whiskey starts in Nashville, and makes a brief stop in Shelbyville to see the Tennessee Walking Horses before landing in Lynchburg. Visitors will tour the distillery to understand the special production process. Tennessee Whiskey is an aged bourbon that has been filtered through maple charcoal to purify it. Locals say it adds a smoothness to the whiskey. After the tour, there’s time in the cute little town to grab a bite to eat or shop for merchandise. The tour is an incredible experience for distillery lovers and cocktail aficionados. However, it’s also an educational experience that will hold the interest of non-drinkers and even youngsters. Jack Daniels is the story of innovation and heritage, the story of slavery and emancipation, and the story of following your dreams. The tasty beverage is a bonus! What amazing drinking experiences are we missing? Share yours with us in the comments below!